Thank you to Regina13 @ UBC Botanical Garden forums for submitting these two photographs from New York (shared via this thread on the BPotD Submissions Forum). Much appreciated! If one recognizes two distinct varieties of buttonbush, Cephalanthus occidentalis var. occidentalis has a distribution range that spans much of eastern North America. The other variety, Cephalanthus occidentalis var. californicus, is native to southwest North America and south into Central America. Treated as one combined taxon instead of two distinct varieties, as is done by the USDA PLANTS database, this becomes a rather remarkable species — a woody plant with a distribution range that spans from Canada into the tropics. In most cases, if asked, I’d say that species with wide distribution ranges are tolerant of a broad suite of environmental conditions. In this case, though, I suspect it primarily (though not exclusively) has to do with having some consistency in habitat across its range; it is a species of wetlands and forested swamps. The Missouri Plants web site has additional images of Cephalanthus occidentalis. 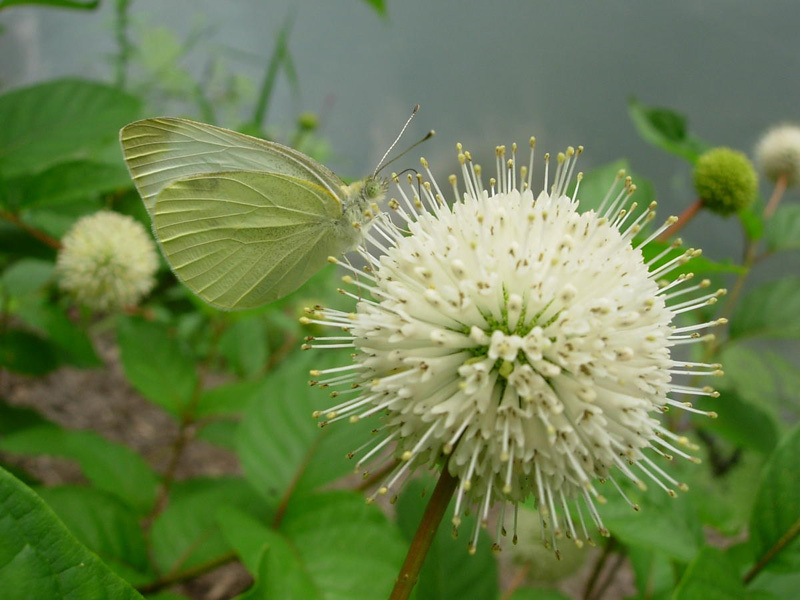 For those of you who are gardeners, you should investigate the Kemper Center for Home Gardening’s page on buttonbush (it is ranked as a Plant of Merit). 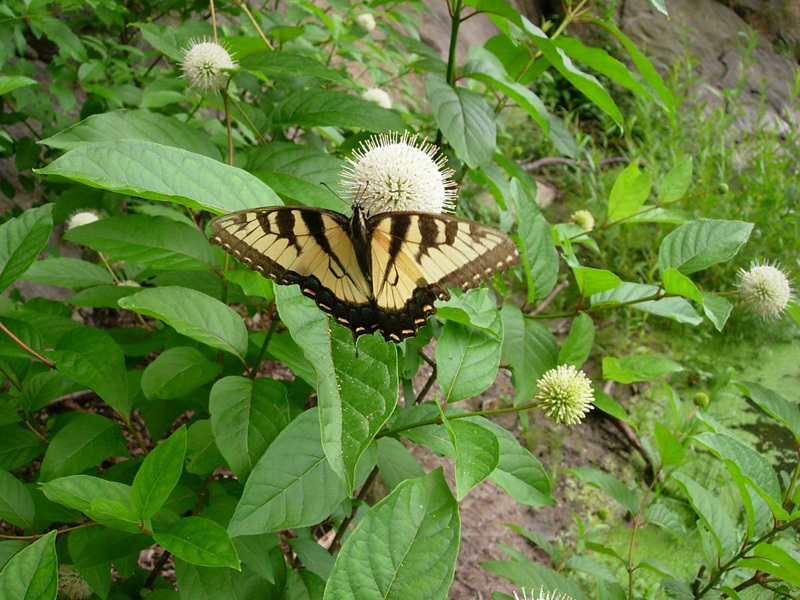 As for the lepidopterans in today’s photographs, the first photograph features an eastern tiger swallowtail. I don’t know the identity of the second butterfly, so I’ll leave that up to one of you (thank you!). Great image! I’ve only discovered this flowering plant this summer in a beautiful wetland area. This is a fascinating plant which bloomed for me for the first time this summer at age 5 years (from a cutting). The flying critters were all over it! The fruit, if that’s what you call it, remains on the bush as the little balls minus the spines. I recommend it; mine grows in seasonal standing water. Excuse my previous comment for showing my botanical ignorance. I guess the “spines” would be – stamens? at BugGuide–if only they did a Photo of the Day too! Thanks so much for the wonderful photographs! In Massachusetts buttonbush is rather common, but in my experience many of the individuals have been thoroughly chewed up by this time of year. I wonder if there is any information on the insects responsible for this. Although ocassionally I have seen some very healthy flowering populations. One useful identifying characteristic is that the toothless ovate leaves occur variably in opposite configuration and also in whorls of three. (There are some lovely plants flowering around Walden Pond in Concord, MA right now). Our local lepidopterist, Taylor Jones, has identified the second butterfly as Pieris rapae, commonly known as the cabbage butterfly or cabbage white. He tells me that it is an import from Eurasia, and it is surely the most common butterfly in our part of NYC , namely Staten Island. Thanks for the beautiful photography and since this bush is such a butterfly magnet I might plant one in my yard . Thank you for the lovely photograph. To have the butterfly on the blossom is wonderful. Thank you I have been looking for this plant for 50+ years. Finally have a name. Now it goes in my garden.